You are here: Hunting Dogs Supplies | Dog First Aid | Bio Spot - Flea and Tick Control- for Small Dogs up to 30 lbs. 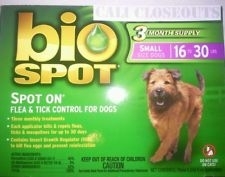 Bio Spot - Flea and Tick Control- for Small Dogs up to 30 lbs. One tube of Bio Spot kills and repels adult fleas, ticks and mosquitoes for up to 4 weeks and kills flea eggs and larvae for up to 4 months. Apply a continuous stripe of this dog first aid product beginning between dog's shoulder blades and ending directly in front of the base of the tail. Isolate from other pets for a few hours after treatment. For use on dogs only; do not use on cats or other animals. Only Size available: Small is for dogs up to 30 lbs. Active ingredients: Permethrin 45% and Pyriproxifen 5%. Please note, due to health issues this product is a non-returnable item.